Mangaluru, Mar 19, 2019: Illegal sand mining in River Nethravathi, including ‘Kudru’ areas in Ullal, have taken a toll on traditional fishing carried out by many families. The families earning a livelihood by catching clam (locally called maruvai) in Kudru in Ullal. Illegal sand extraction has severely affected livelihood of families as clams and fish are not available in the river for a year now. 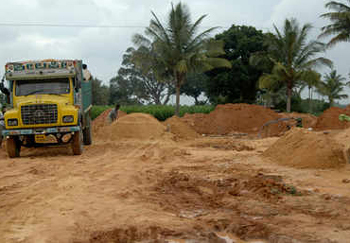 Despite our complaints to the authorities, illegal sand mining continues unchecked, another resident rued. “About 100 clams fetch Rs 50. It was much less a few years ago,” said Usha, a home maker.